If equipped, the vehicle can connect to Pandora®, Stitcher SmartRadio™, or other available applications through the infotainment system. The applications must be downloaded to the device first, then the device can be connected to the infotainment system. Pandora is a free Internet radio service that streams personalized radio stations based on artists, songs, genres, and comedians. Create stations using the Pandora website or smartphone application, then use - (thumbs up) or , (thumbs down) to personalize stations. To set up an account, or for more information, go to www.pandora.com. Pandora may not be available in Canada or Mexico. Stitcher SmartRadio is an Internet radio service that streams news, sports, and entertainment shows through the audio system. Create personalized, on-demand stations or discover new shows through Stitcher's preset stations. To set up an account, download the application from the Android Market or iTunes Store, or go to www.stitcher.com. A phone or tablet with Internet connection and the application installed is required. Personal cell phone data plans are used. Make sure the latest version is installed on the device and the volume is turned up. Connect an iPod/iPhone using the USB port. Connect Andriod™ phones through Bluetooth. Your iPhone is locked. To resolve, unlock the iPhone. You have another active application open. To resolve, close the other active application. You have not installed the application on your iPhone. To resolve, install the application on the iPhone. Activate the application on your iPhone, then press the desired application menu on the infotainment system. Reset all settings related to the phone, then press the desired application menu on the infotainment system. Reconnect the smartphone and infotainment system through Bluetooth wireless technology, then press the desired application menu on the infotainment system. When the application is stopped on the smartphone, it usually takes time to return to normal operation. Try to activate the application after 10–20 seconds. To switch to another application while playing an application and connected through the USB port, press the HOME button on the iPod/iPhone, then press the application icon on the infotainment system. 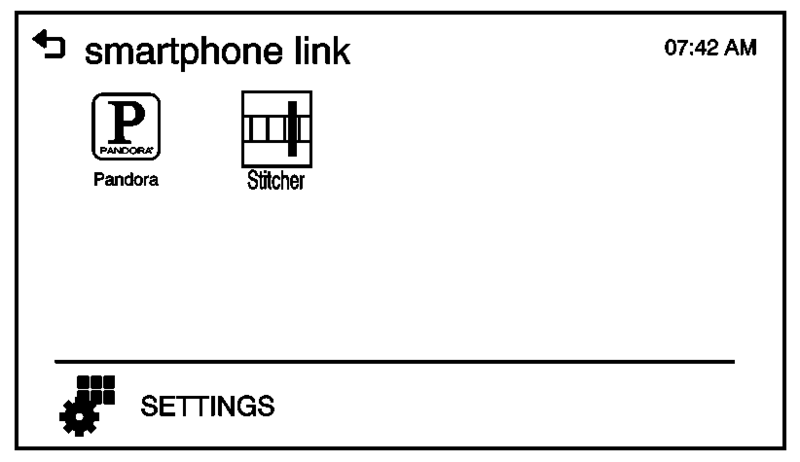 When the iPhone is connected to the infotainment system through the USB port, and the infotainment system is connected to another phone through Bluetooth wireless technology, press iPhone or bluetooth phone on the smartphone list menu to switch between the two applications. Press the desired application icon to hide or display it on the smartphone link menu. If the activated application is on the smartphone link menu, the ^ is activated in the upper position of the HOME menu or playing screen. This section explains a general operation. It may vary depending on the phone operation system, versions, and/or application versions. Install the application on the smartphone from Appstore or Playstore. Connect the smartphone to the infotainment system through the USB port or Bluetooth. Press D to play the application through the infotainment system. The smartphone link menu is displayed. The application screen is displayed.